Someone’s got to explain this next part to me. I bought it on Amazon specifically because of price. Actually, Amazon made the arrangement. I bought from a company named Ibex. Executive decision. If I’m going to the hospital, I’m going with a toy. Don’t force logic on me. 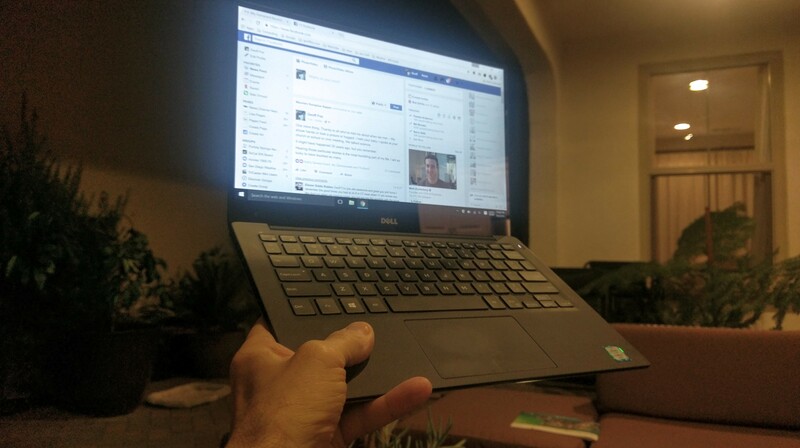 A new Dell XPS 13, a very powerful little laptop, arrived Wednesday. The base is machined aluminum. It is solid. There’s a fan somewhere inside, but it’s silent and that’s the only moving part! No more hard disk drive. No CD/DVD. No Ethernet port either. They’ve gone the way of the floppy. It weighs 2.8 pounds and will run around ten hours on a charge. I have no clue where the battery’s hidden. There’s no bulge or anything that looks vaguely removable. My laptop was priced $356.99 less than all the major retailers like Fry’s and Best Buy. Dell itself sells to the public at retail. I had it in writing so I ordered. It came in the sealed box as promised. Everything looks perfect. I had some trouble this afternoon, nothing major, but I had to call Dell. They read my service tag and provided service. I guess I am legit. I just can’t figure out how one vendor can chop so much off the price. Immediate impressions are it’s fast, quiet and small. I have the screen adjusted so the type’s a nice size. I like the keyboard with it’s very solid feel. I’m getting used to the trackpad, but it might take some time. I’ve already turned off a few trackpad ‘features’ that get in my way. They’d better have good WiFi in the hospital! I’m planning on documenting my stay. Wow that’s quite a discount! I just read an article from HowToGeek.com from someone who bought a PC at an amazing price from Amazon (from a third party seller) and it came with a pirated Windows license. It was an interesting article. That would be my luck! I still have my son’s laptop from 2008 – Windows Viata and dead battery so I’m tethered to an outlet. Bought a customized HP $1500.00. Every bell and whistle I could get. Windows 10 biggest processor available…A month almost to the day of plugging it in, the hard drive Literally COOKED! They wanted me to box it ship back to China. GEEK SQUAD COMETH, $250.00 Goith! Then HP in India calls asks for the old Drive. Sorry I don’t have it. That sounds like a nice small laptop. I’m just posting to ask you if it really has a fan. Since it has no optical drive and no spinning hard drive, it may not (unless of course something specifically says it has a fan). I have an HP Stream, which is a small, cheap laptop, with a 32 GB SSD, which isn’t even a real SSD, more like a flash drive, for memory. It has no optical drive and no fan. Also, my HP Stream’s battery isn’t user-replaceable. I’m not sure what I’ll do when it goes, but it was cheap. I bought it on Groupon for about $125, refurbished, but I couldn’t tell it from new. The Stream is fun, has long battery life and one USB2 and one USB 3 port, but it would never do as a primary computer. As I said, its fun to use, is small and light and has very long battery life since its got no moving parts at all. It has a fan, I’ve never heard it. There are a bunch of those based on Atom CPUs and they’re perfect for what you’re doing. I decided to spoil myself this time. Nice little toy, FOx. I just recently picked up a new laptop from a company named Sager out in City of Industry. 256 G SSD C:, 1T D:, 8 G of RAM, Intel iCore 7. Love it!! Just to let you know that candle was lit at St. Agnes this morning. Fingers crossed and whatever else I can do to bring you luck. Carry on, Fox and Godspeed. Was just catching up on your blog. Sorry to hear your recent news, but wish you the best with your surgery and full recovery. Sharing your story will help others too-thank you! Previous Previous post: They Shoot Insulin, Don’t They?